Taking Back Your Yard! Mosquitoes Beware! Our Mosquito Control Barrier Spray Program utilizes an EPA-registered solution that our trained applicators apply to trees, shrubs and foliage surrounding your outdoor living areas. A onetime spray will eliminate existing mosquitoes and repel them for approximately 21 days. No mosquitoes… GUARANTEED! Our applicators will return every 21 days to remove mosquito habitats and reapply the EPA-registered solution to your outdoor living space, breaking the mosquito lifecycle. By purchasing this package, you enjoy the convenience of auto-billing. No more citronella torches or candles… just mosquito free outdoor living. We start by identifying and treating the mosquito habitat around your home, dramatically reducing the population. Then, we locate the areas where mosquitoes hide as they wait for their next victim. We apply a light mist of a very mild insecticide formulated to repel mosquitoes for the next three weeks. We return once every three weeks throughout mosquito season to reapply our Barrier Spray Program solution. Our barrier spray formula is so specialized that beneficial insects such as honey bees, ladybugs, and butterflies will return and be unaffected. And just to set your mind at ease … the formula we apply in your yard, is a milder concentration of the active ingredient used in shampoo prescribed by Doctors to treat lice in children’s hair. It is also the active ingredient in flea and tick shampoo most often recommended by veterinarians for use on pets. 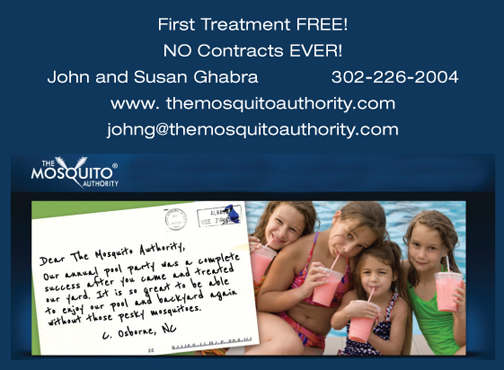 We are so confident in the effectiveness of Our Barrier Spray Program that we offer a “No Mosquito Guarantee”. If mosquitoes bother you during the three-week interim between treatments we will return and provide an additional treatment Free of Charge. We are proud to offer our customers The Mosquito Authority automatic mosquito control system. When you want to take in the pleasures of your own yard – patio or pool, fun with kids or parties with adults – you deserve to do so in complete comfort. You shouldn’t have to be at the mercy of annoying insects and their painful bites. Fortunately, you won’t be with our proprietary misting system that effectively eliminates mosquitoes and other biting insects from your yard. Our system automatically sprays a very fine mist of botanical insecticide through a nozzle circuit that is installed on your property. 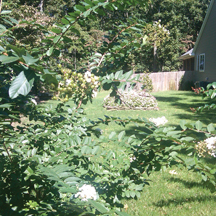 Once installed, our system virtually disappears into your landscape. You won’t even know it’s there. Whatever your requirements, a mosquito misting system can be customized to fit your yard perfectly. The real value in owning a mosquito misting system is being able to enjoy an evening cookout or send your kids out to play after dinner without even thinking about mosquitoes. . . or your mosquito misting system. Contact us for more information on our misting system.